One of the reoccurring themes of my attempts at adulthood is the battle between my need to live a creative life while contributing to a more equitable and just society. It seems that jobs I’ve held either ignited my creative muscles or made me feel good about the impact I was having on people’s lives—but not both. Somewhere along the way, I decided that if I were going to have a job that fulfilled both the creative and bleeding heart aspects of my personality, I would simply have to come up with it for myself…and according to Chris Brogan, that makes me a freak. 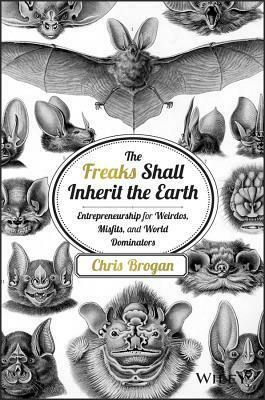 As Brogan defines the term in his new book, The Freaks Shall Inherit the Earth: Entrepreneurship for Weirdo’s, Misfits, and World Dominators, freaks are those who use their unique life perspective as a business advantage. For me, I see a life equally dedicated to creativity and social change as completely possible, and that’s how I’ve structured my writing business. Freaks is a great read, and one that doesn’t take very long because of Brogan’s ability to discuss complicated issues in a very simple, yet powerful way. After my first read of Freaks, I found myself constantly going back to the concept of community. Brogan deals with community a lot in the book with concepts like monchu—an Okinawan phrase that means “one family,” which Brogan uses to emphasize the importance of bringing value to those around you. Outside of directly talking about it, though, the concept of community seems to be the foundation that holds the book together—at least that’s how I read it. Perhaps that’s because I had my own aha moment with community when I heard Brogan speak live recently. In my post last week, I mentioned a moment I had listening to Brogan deliver a keynote speech at a conference I was attending. During the speech, he asked the audience a very simple question: What community do you want to serve? After he posed the question, the words “artists and changemakers” popped into my head and I wrote it down in my notebook. All of a sudden, I had a really clear understanding of the community I wanted to serve. The beauty part is, from there, all the things I would learn over the next few days became actionable because I had a clear vision of who I was working for. While I (and I’m sure you) have heard advice like this before, viewing it through the lens of community makes it more actionable. I really care about artists and changemakers, and I want to see them realize the best of themselves. My goal as an entrepreneur, then, is to offer my writing services in such a way that I am able to help my community realize their best. Viewed through the lens of community, goal setting (even if simple) becomes less intimidating. Community is also a great framework to use when thinking about what success looks like. One of the great things about Freaks, is that Brogan gives readers permission to define success themselves. When he discusses building “Your Own Personal Success Recipe,” he includes the material and immaterial things that all humans care about at some level. Money is important, but so is time spent with family. Achievements and accolades are important, but so too is seeing steady progress. The recipe isn’t the same for everyone. Further, each freak has the right to define the lens through which success is viewed. In my eyes, community offers a helpful perspective. One of the things I’ve been considering lately is when to start building a team for my business. If my goal is to help artists and changemakers realize the best of themselves, and I achieve that through writing, I have to think about my capacity to do that alone. I’m a painfully slow writer, so there will come a point when I can no longer serve my community in the best way on my own. Thus, for me, part of my success vision is thinking about the kind of team I want to build. Brogan acknowledges that not everyone, freaks especially, like to think of their lives or work in terms of systems. Until I defined my community, I felt no urgency around systems building. Now that I know the community I’m serving, I see the benefits of serving them in an efficient manner. I recently started a very sophisticated system of business development. It involves drawing grids on construction paper and listing business prospects with seven columns representing each outreach I’ve made to try to cultivate that relationship. I also have “prospect sheets” where I write out (by hand) the basic points of research I conduct while considering if a prospect is a good fit for my services. My prospect sheets are color coded with markers, held together by pink paperclips and stored in a manila folder. Every week, when I make a new list, draw a new chart and start a new set of prospect sheets, I chuckle at how un-technical it is; yet, it works for me. It keeps me disciplined, consistent and focused. More importantly, it puts me in the mind frame of learning more about my community and figuring out how I can help them. Even if I don’t create a business relationship, I expand the opportunity to bring a new changemaker into my community by reaching out. And trust me, none of it would happen if I didn’t have a system making me do it. Freaks is a great book on many fronts, but if you’re in a place of trying to get unstuck, I urge you to read it through the lens of community. In my experience, understanding one’s community can facilitate the transition from, “Maybe I’ll keep doing this business thing,” to “This is happening!” I understand, first-hand, that being an artist or changemaker isn’t the easiest road to take…but as Brogan writes in his book, that’s what makes us freaks—choosing the path of creativity even if it means facing more resistance. Still, there are ways to ease the life of being a freak, and I think determining who you’re in it for is a good place to start.